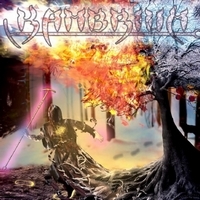 Kambrium is a young band from Germany and Shadowpath is their debut album. The intro is called Shadowpath and in an epic way it leads you into Among The Lost. It's a riff-based up-tempo tune with keyboard elements and growls which are more a kind of deep raspy spoken words... Arming For Retribution is an epic tune where the youngsters switch between thrashy riffing and deep growls and more epic passages where the keyboard is more up-front. Partly it seems to me a bit out of place... At Feuer gegen Feuer bassist and singer Martin is going to grunt. The band is using breaks to stay away from monotony, but keeps the different sounds / tempi in balance. At Feuer gegen Feuer they even embed a flute! At Hollow Heart you get some clean vocals next to growls, but the clean vocals don't work too well, here the limitations of the singer are quite obvious. But if they want to keep using clean vocals, then a few lessons and experience should do the trick. The atmospheric opening of Hiding In Sorrow reminds me a bit of Tiamat at Wildhoney times... Usually I'm not a fan of instrumental music, but Kambrium really do good here. At Dewfall it's the guitar play which hooks you up, even if not memorable it's calls for your attention. At the closer A Sinner's Remorse they have time to experiment as the tune is just shy of 8 minutes. And so they even embed a citation of a classic composition - and that's done very well. The quintet try to create their own sound and manage quite good, but it lacks some memorable riffs or melody lines... They work with breaks to keep the tracks interesting, but not everything they present works out. One of their assets is the guitar play and the fact that the keyboard is playing a supporting role and that keyboarder Jan isn't overdoing it. Usually I like the combination with clean vocals and the ideas aren't bad, but the execution of the clean vocals need to improve. Anyway, the Germans deliver a decent debut.